Meal planning, grocery shopping, cooking. Or maybe you’re just a bit ‘meh’ about it all. I hear you. You have so much going on in your life right now that meals have stopped being enjoyable times with the family and have become another source of stress in your day. Let’s take some of that stress away. Today, I have 3 simple meal planning options that will make your life easier. All you have to do is choose the one that suits you best. Option 1: Simple Cyclical Meal Planner. A month’s worth of dinner ideas! If you really hate meal planning and never know what to cook, just use this every month. It’s based on our family favourites. Most people have their favourites on rotation anyway, this way you have 30 of them! But you’ll need to find recipes and ingredients for them so there’s a little work required. Put aside 3 hours each week to check the plan, find your recipes, check your fridge, freezer and pantry and then grocery shop. 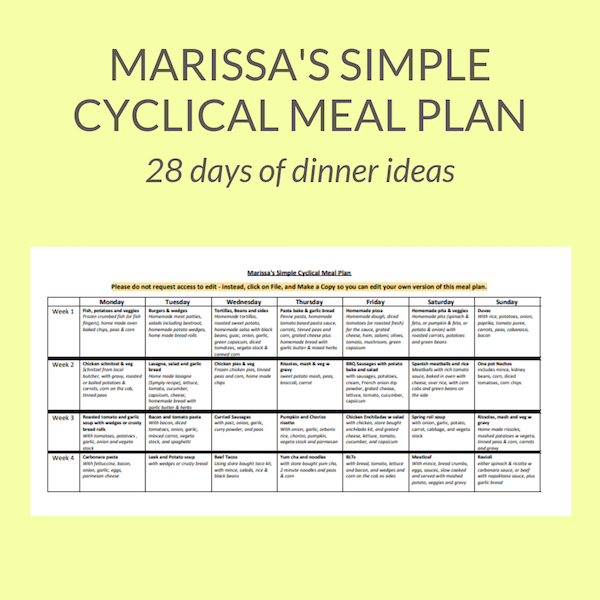 The simple cyclical meal planner is FREE and is in my Freebie Library. Sign up here for immediate access. Option 2: Dive and deep and master the skill of meal planning. Make meal planning YOUR thing. The thing you excel at. Dive in deep with with my Simple and Successful Meal Planning program and use the tips and tricks I love to make meal planning more enjoyable. I show you how to plan your meals in a way that works for YOU and your family, where to find dinner ideas (and how to actually enjoy finding them), how to handle picky eaters smoothly and reduce dinnertime complaints from your partner or children, and how to save money with your meal plan (without needing to shop at 9pm). Put aside some time to go through the program and tailor it to suit you, then you’ll only need a couple of hours each week to take care of your planning and shopping. The Simple and Successful Meal Planning Program is $97 for lifetime access and includes a private Facebook group with access to me when you need it. Sign up here for immediate access. Option 3: Have someone else do most of it for you. This one is perfect for you if you love the idea of eating at home with your family, you like to cook, but you HATE to plan and shop. The Eat at Home Meal Planning service creates meal plans for you, includes printable recipes AND also gives you colour-coded shopping lists. All the work is done for you, you just shop and cook. The 15 minute meals and the 1 hour freezer stash will change your life! Plus, if you grocery shop online, you don’t even have to go out and get your own food! You’ll save a ton of money by not eating out or getting take away, you’ll have fresh healthy meals that are easy to make ready to eat with your family, and you can have all the credit for barely lifting a finger. The best part? You get access to not just one kind of meal plan, but four of them, including some special dietary requirements: Traditional, Wholesome Traditional, Slow Cooker and No Flour, No Sugar. The Eat at Home Meal Planning service is currently on sale for a VERY limited time - get 30% of your membership when you sign up by September 19, 2018 and use coupon code FALL at checkout. *I'm an affiliate for the Eat at Home Meal Planning Service.